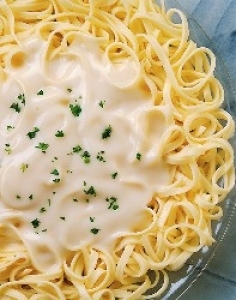 Have you made Alfredo Garden Lasagna? 1. Lay out enough dry lasagna strips in a 9x13 pan to ensure you have enough to make 3 full layers, with very little overlap on each layer. 2. 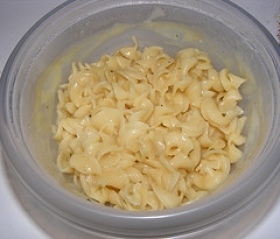 Remove the dry strips and cook according to package instructions until barely al dente and drain. 3. 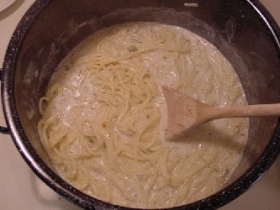 ALFREDO SAUCE-Heat water to a boil in the bottom of a double boiler. 4. 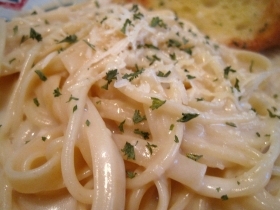 Add butter, cream and pepper to the top pot and heat until butter is completely melted, then stir in Parmesan until melted and blended. 5. Remove top pot and set aside to cool. 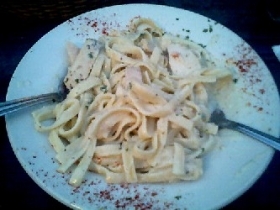 Divide the sauce into 2 equal portions. 6. Refrigerate 1 portion for use later. RICOTTA CHEESE MIX- Combine all ingredients in a bowl and blend thoroughly with a rubber spatula. 7. Set aside at room temp. 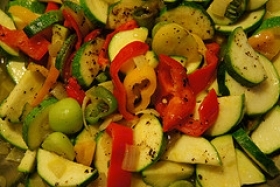 VEGETABLES-Combine all veggies and mix well. 8. ASSEMBLY-Coat the bottom and sides of a 9x13 baking dish with vegetable spray. 9. Lay out cooked lasagna strips (about 4) to cover entire bottom. 10. Spread 1-1/4 c of the Ricotta mix evenly over the strips. 11. Top with 8 c of veggie mix and spread out evenly. 12. Lay out 9 of the mozzarella slices to cover the veggie layer. 13. Repeat this layering. Top the second layer of mozzarella slices with lasagna strips and spread them evenly with 1-1/4 c ricotta cheese mix to finish. 14. COOKING-Spray a sheet of foil with vegetable spray and cover the baking dish tightly with the foil, sprayed side down. 15. Bake in a preheated 375~ oven for about an hour or until the internal temp is 165~. 16. Remove from the oven and allow to sit for a few minutes, covered, before cutting and serving. 17. Immediately prior to serving, heat the reserved portion of Alfredo Sauce and ladle the hot sauce over each slice of lasagna as it is served. 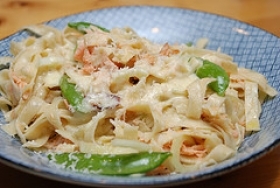 This recipe is high in Vitamin A with 177% of your daily recommended intake per serving. This recipe is high in Vitamin C with 273% of your daily recommended intake per serving. This recipe contains potential food allergens and will effect people with Wheat, Butter, Gluten, Mushroom, Bell Pepper, MSG, Cheese, Spring Onion, Onion allergies.